The ghd Air Hair Dryer – Our favourite hair dryer. Hair dryers are small personal care appliances that blow hot or cool air over wet hair to speed up evaporation and result in dry hair. Duh. Just kidding, there’s actually more to it than that. While you can indiscriminately dry your hair, hair dryers can also be used to style and get that ‘blow dryed’ look. Hair dryers can straighten and style hair in much the same way as other heated hair products. The heat emitted alters the hydrogen bonds present in the hair and causes them to shift position. If you comb your hair straight and apply heat, the bonds will straighten and stay that way until they get wet, or if you wrap hair round a cylinder (like a tong) and apply heat then the bonds will fix in the curly position. While the handheld hair dryer was invented in 1920, technology has caused it to change in effectiveness if not in looks and today hair dryers are kinder on hair and faster to use. Hair dryers work simply by drawing air in across their electrically heated elements and blowing then newly heated air out. Most modern hair dryers have temperature settings to suit different types of hair and different styling preferences. In the last decade hair dryers, like hair straighteners, have turned to ceramic and ionic technology. With ceramic elements, the hair dryers can heat instantly and don’t require warming up and the ionic factor aims to reduce static and increases the smoothness of hair. 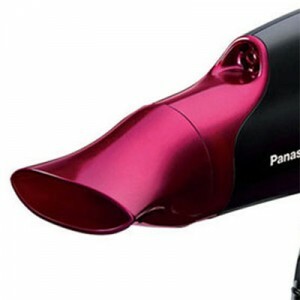 Many brands of hair dryers also provide add-on attachments for various styles and all sorts of new technologies are arising in hair dryer models every year. 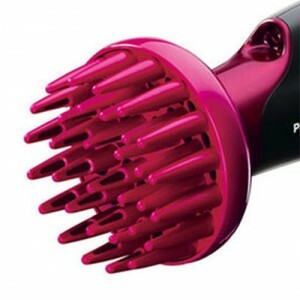 Hair dryers are fairly standard in that they all do the same thing – dry hair. The main variation of individual hair dryers are whether they use ionic technology, add moisture, have temperature settings and those that have attachments like diffusers. Ionic hair dryers emit negative ions, which break water droplets up into smaller molecules and allow them to evaporate much faster. This means it technically takes less time to dry hair, resulting in less damage from heat application. Whether this is actually the case seems to be pretty dependent on the hair dryer though, suggesting that it’s not all that useful. While ordinary hair dryers cause static to build up, this can be negated by using conditioners and heat protective hair products rather than an ionic hair dryer whose affects only last why the hair dryer is turned on. So while many of the leading brands advertise ionic technology, it may not necessarily be a reason to fork out an extra £40. If you’re looking for completely smooth hair and like that ionic hair dryers create that from the get go, preventing frizz caused by drying, then looking for a good hair dryer that also has ionic capabilities isn’t a bad idea. As with ceramic hair straighteners, some hair dryers use ceramic elements instead of metal ones to create a completely even heat. This means heat is the same as it hits all parts of your hair. Ceramic elements also heat up faster, meaning that your hair dryer is ready to be used at its full capacity from the moment you turn it on. Hair dryers often come with some form of attachments, which are really useful for some and not so useful for others. Without any attachments, hair dryers tend to make you look and feel like you’re standing in a wind tunnel. You can’t dry your hair too effectively because you can’t actually see yourself in the mirror for all the hair whizzing about in front of you. While this method dries hair fairly quickly, you’ll end up with a bit of a bird’s nest that will take you another half an hour to detangle. Not ideal. Diffusers are common attachments that, quite literally, diffuse the air being blown out. Instead of a steady stream of air blown in one direction onto hair, the diffuser is made with curved plastic rods that cause the air to move around and hit the hair from different angles, breaking the flow and giving hair an easier time. Because the airflow is disrupted, it doesn’t cause the hair to blow around very much and shouldn’t cause much tangling. Diffusers are usually recommended for those with wavy and curly hair because these types don’t benefit too much from a direct blast. The air can get to different sides of the curls and waves and dries them much more effectively than without, even though drying does take longer. Hair is usually softer and happier after being dried with a diffuser and I highly recommend them, even for straight hair. Concentrator nozzles are another common attachment and are the opposite of diffusers. While diffusers break up airflow, concentrator nozzles focus it. By directing air only onto a small section of hair, it allows controlled styling for heat-made curls or flawless straightness. The key to the concentrator nozzle is always keeping it pointing downwards to prevent damaging the hair and, as it’s very concentrated hot air, don’t let it touch your hair. 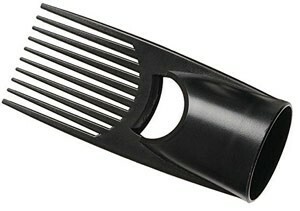 The hair pick attachment looks scary but creates good volume without needing an extra hand. Longer spiked picks are suitable for long hair and shorter for short hair. The picks lift hair and the air gets underneath to create volume. 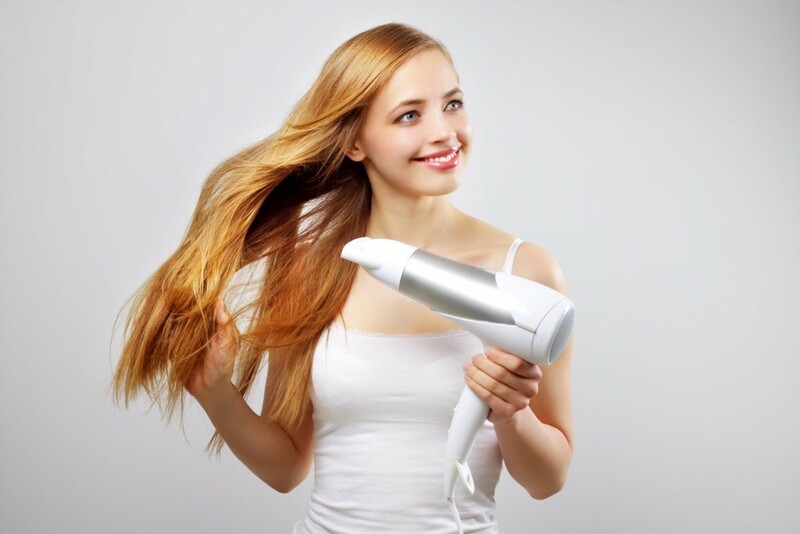 The main advantage to using a hair dryer over air-drying is pretty obvious – your hair dries faster. In winter, air-drying is impractical if you’re leaving the house and damp hair will make you cold and probably stay damp in the wet, winter air. (Although it probably won’t give you a cold in all honesty). While in summer air-drying is much more possible, it still leaves your hair to do exactly what it wants to – not always a good look. Using a hair dryer properly and with smoothing or heat protecting products can also improve the condition of your hair whereas air-drying merely leaves it to fend for itself. If you have dry hair, a mixture of both is good but a conditioning product used with a hair dryer could benefit you. Hair dryers dry, style and seals the style with a cold shot of hair. This is great for work or a full day out as you can style your hair in the morning with heat then that cold shot to finish and not have to worry about your hair for the rest of the day (unless it pours with rain and you’ve forgotten your umbrella!). With air-drying, this kind of styling before work is just impossible. Don’t hair dryers damage hair? A big problem with hair dryers is that they can damage hair and that puts off a lot of people. But they can damage hair in the way a kitchen knife can damage a person – if used incorrectly. Modern hair dryers are far superior to their older peers and are much kinder on hair. Temperature settings are one of the most crucial points to look for when choosing a hair dryer because everyone’s hair is different and different heat settings will have different effects. The easiest way to damage your hair with a hair dryer is to use it too close to your hair and on a too hot setting. Hair strands are made up of layers and the outer layer with an overlapping, scale-like structure, is the first to be damaged by hot air. Saying that, hair that stays wet for a long period of time is also weakened and easily damaged – the key is to dry your hair without damaging it. A hair dryer on a medium setting at least 15cm away from your hair is the best option for most people. If your hair isn’t in great condition then a conditioning heat protective product is particularly useful. If you don’t like using product on your hair then use a cooler setting – it might take longer for your hair to dry but it’ll be healthy. For those with stronger hair, even a hot setting 15 cm away from your hair will be fine and a conditioning heat protective product will be an added bonus. Air-drying can keep the hair wet or damp for too long, especially in colder months and this in itself will stress the hair, causing it to stretch and break. A hair dryer isn’t damaging, as long as you use it properly and on a setting suited for your hair. This is why you should always go for a design with a good selection of temperatures. The wattage of a hair dryer is the power it has and the energy it uses. Higher wattage hair dryers between around 1800W and 2300W are great for fast blow-drys, professionals and those with long, thick hair. Lower wattages have less power and are usually lighter – good for travelling and fine or short hair. There is another note to consider when choosing wattage…the higher the wattage, the higher the energy, the higher your energy bills. 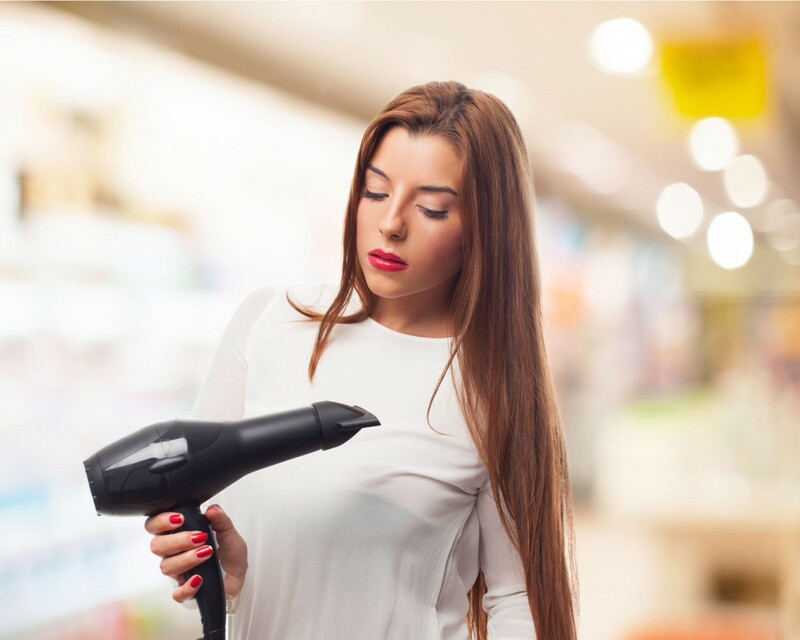 The EU have already floated the idea of banning high wattage hair dryers (and many other appliances) from the market in a bid to cut Europe’s energy usage. It’s not something that should be taken lightly, especially if you use your hair dryer every day. How do I find the best hair dryer for me? Hair dryers are no longer just one design and serving one purpose – different models are designed for certain types of hair, styling possibilities and lifestyles. While some come with an array of attachments that look more at home on the set of Star Trek, others are designed for shorter hair or travel. So what exactly are your personal requirements? If you have curly or wavy hair, you should definitely be looking for hair dryers with diffuser attachments, which will allow your hair to dry without flattening or overheating the form. Straight hair doesn’t necessarily require any additional attachments but if you want poker straight hair then the concentrator nozzle can help. The main issue is to get a temperature setting that suits your hair as damaged hair stands out more on straight hair. Using an ionic hair dryer and perhaps even conditioning heat protective spray will also be beneficial to cut out any frizz that might threaten to disrupt your straight locks. If you have very short hair then attachments aren’t really necessary. While your hair will stay healthier in general because it has a faster turnaround, if you dye regularly then drying out can still occur. If your hair doesn’t feel like its best, use a hair dryer on a lower temperature setting instead of a usual high one and use a heat protective spray. A hair dryer with lower wattage can be used on very short hair and this means that you could go for lighter weight models. Long hair takes considerably more time to dry thoroughly and as a result, hair is subjected to heat for longer. This means more opportunity for damage. Hair dryers with an array of heat settings will definitely be beneficial, especially if you use a hair dryer every single time to wash your hair. Due to the construction of hair strands, drying hair quickly on a low heat is the most healthy option and remember to keep the flow of air pointing slightly down if you’re not using a diffuser. Air travelling up the strand will damage the hair. A hair dryer with a high wattage, 1800W and up will suit very long hair the best as it will have the power you need to get through the heavy layers. Fine, flyaway hair can still be healthy under the watchful gaze of a hair dryer but you’ll definitely want something on the lower wattage scale. You don’t need to blast fine hair with power at all and besides, lower wattage hair dryers are usually cheaper! Lower wattage dryers don’t have as long a life as higher wattage dryers so be aware – quality still counts. For those who travel a lot nationally and internationally and still want to use their hair dryer, a lighter option is essential. Many modern hair dryers are high quality and do a fantastic job but they can be quite heavy. Either a particularly lighter hair dryer, or a hair dryer designed for travel is what you need to look for. Remember to check the plugs and voltage too – most travel specific hair dryers will have dual voltage 110/120V and 220/240V, allowing them to be used safely anywhere. You’ll still need a plug adapter for countries with a different pin set-up. So now you know that you’ve got to think about your hair type, length and health before you choose a hair dryer. Take a look through the reviews on this site and each one will specify the hair types it’s suited to – making life so much easier for you. It’s worth looking around at the different models of dryers, even just for laughs, some designs are pretty weird.